discovers Timna Mushroom (for herself). Timna is an Egyptian controlled mining area that produced copper and turquoise. The Egyptians mined copper & turquoise at both Timna and Serabit el-Khadim. Jezirat Faraun was the Egyptian mining sea port that served Timna. Since Jezirat Faraun is not located in Edomite territory, it cannot be Ezion-Geber which was located under the modern shipping yards of Aqaba, Jordan. A much larger copper mining operation is located at Khirbat en-Nahas, located 38 km north of Petra that the Egyptians never mined at. 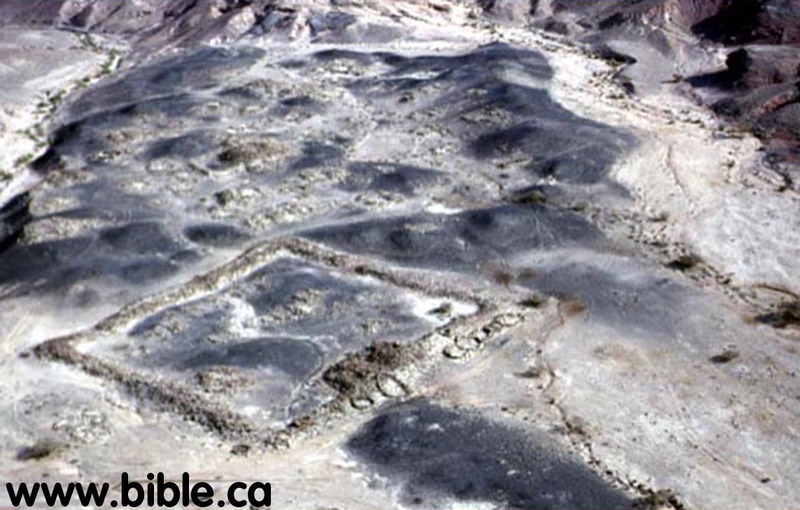 This site has a fortress built by Solomon. It is strange that Solomon did not built a fortress at Timna. A logical reason would be that Khirbat en-Nahas needed a fortress since it was a hostile take over, whereas Timna was restarting a mining operation that had been dormant for 300 years. Also, the fortress at Elat/Kheleifeh would better serve to protect Timna. The pottery finds at Timna are almost identical to those found at Jezirat Faraun. Three types of pottery were found: hand made, ordinary wheel made and two colour Midianite. The identical Midianite pottery has been found at Timna, Jezirat Faraun, Al-Bad (near the Straits of Tiran) and Qurayyah north east of Mt. Al-Lawz, where they found the factory where the Midianite pottery was made and exported. The Kenites migrated with Moses to the promised land and settled in the Negev. They are the link between Israel and Midianite pottery. The Papyrus Harris I, dates from the Ramesses III and proves there was a huge mining operation at Timna in 1250 BC. The papyrus describes how asses were used to transport the copper from Timna to the sea port of Jezirat Faraun, then shipped to Egypt by "galleys" (ships). It also show Trade routes & Evidence of extensive Egyptian control of Timna in 1500-1250 BC. 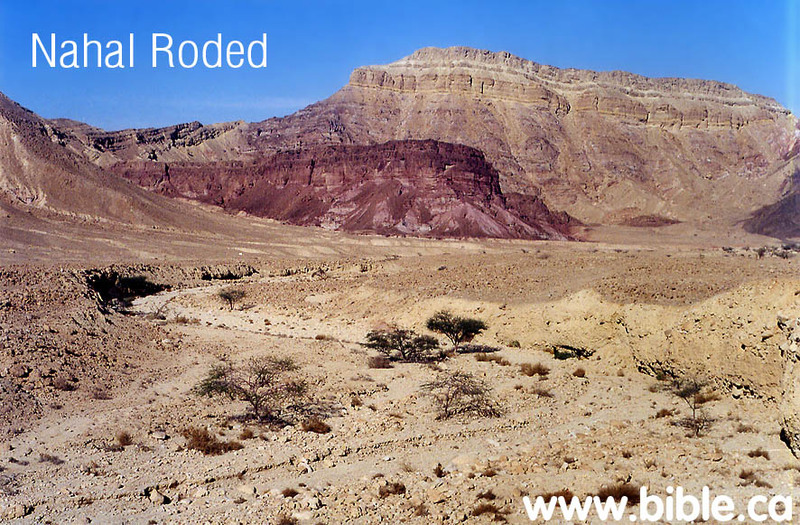 In 1406 BC, the Kenites migrated into the promised land with Moses and settled in the Negev. In 1200 BC, the Kenites converted the pagan Egyptian temple of Hathor, into a possible memorial site for the bronze snake on the pole Moses made. 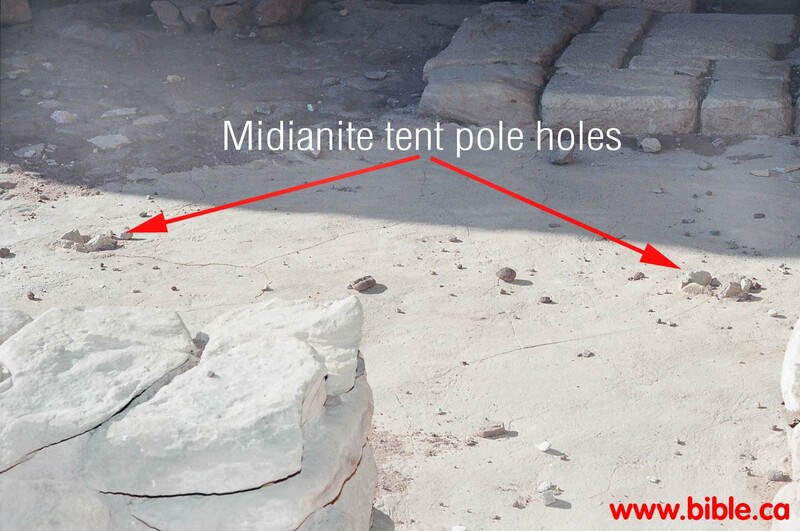 Post holes were dug by the Midianites (Kenites) and the temple of Hathor became a "tented shrine" perhaps because the tent of the wilderness was first built by Moses near the Midianites home town at the foot of Mt. Sinai. Some speculate that the entire concept of the tabernacle in the wilderness was originally a Midianite concept that Jethro used as high priest of the one true God! The exodus occurred in 1440 BC and Israel crossed the Jordan in 1406 BC. 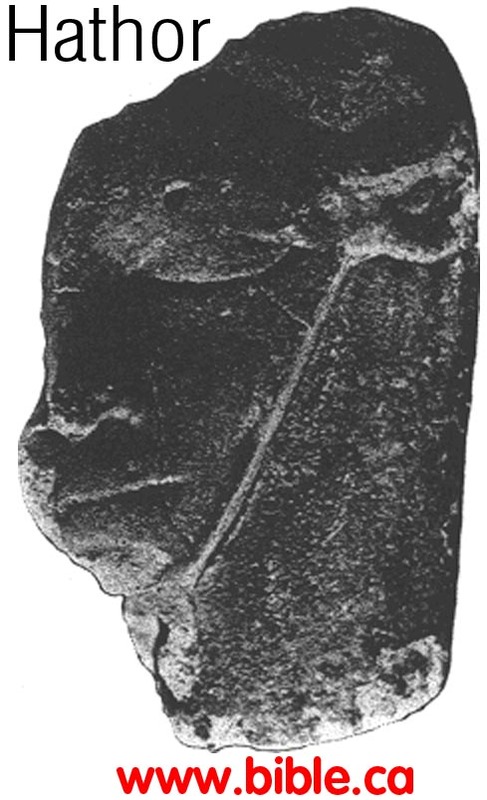 During this time Timna and the port Island of Jezirat Faraun were under Egyptian control. There were trade routes that crossed from Timna over to Egypt through the modern Sinai Peninsula. It was a heavily traveled and guarded route by the Egyptians. Remember that Serabit el-Khadim was the other major mine in the Sinai under Egyptian control. This underscores how absurd it is to suggest the exodus route traveled through central Sinai using the same roads that the Egyptian miners used between Timna and Egypt. We know that the promised land did not originally extent all the way down to the Red Sea (Gulf of Aqaba). Now we know the reason! God did not want to interfere with the Egyptians at Jezirat Faraun and Timna. If you look at the map, you can see the yellow dotted line that represents the southern boundary of Judah. When Israel took possession of the promised land in 1406 BC, the Kenites (Midianites) who joined Moses settled in the southern Negev within the territory of Judah, likely in the Mountains on the western edge of the Arabah. It is clear that the Kenites (Midianites) who migrated from Arabia to the promised land with Moses became involved as co-workers at the Timna mines only in its last phases of operation. This proves outright Egyptian control at the time of the Exodus, changing to a partnership with Israel until the mines were abandoned in 1200 BC. Then Egypt was expelled entirely from the Timna/Elat area by Solomon in 950 BC for a short time. This fits perfectly with what the Bible says. 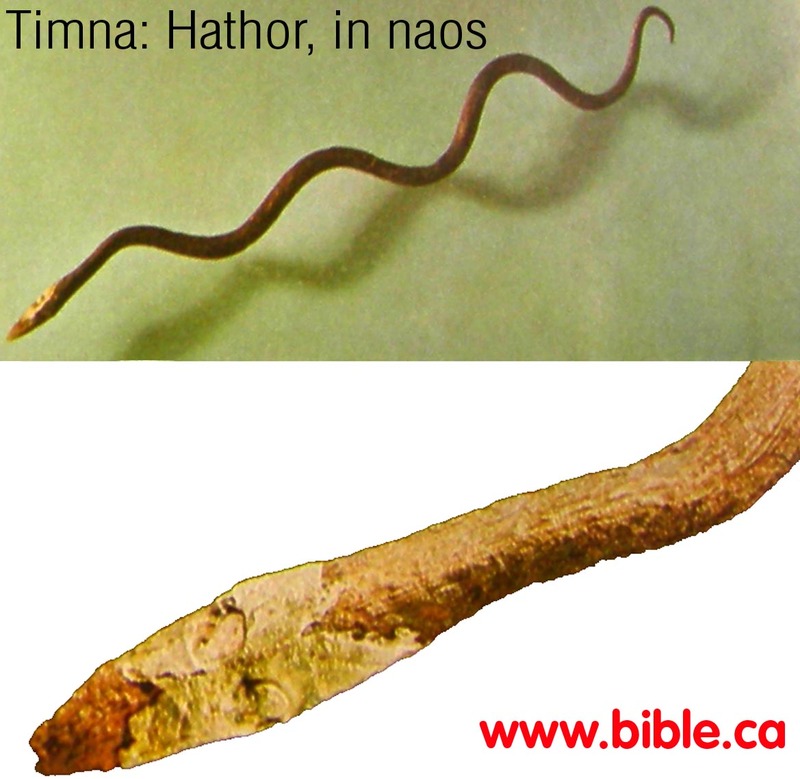 There are two key elements that connect Timna with the exodus route: First, Timna is situated about due west of where Moses set up the brass snake on the pole: Num 21:1-10. After the Egyptians abandoned the mines in 1200 BC it seems that the Kenites may have used the naos of the temple of Hathor as a memorial site for this very event. A bronze snake was found inside the naos. Second, The kenites also converted the temple of Hathor into a tented area, digging post holes visible today which may be a kind of "tented tabernacle, like the one Moses built in the wilderness at the foot of Mt. Sinai near Midian! Click here for a discussion of pottery. There are three kinds of pottery found at Timna: "normal" ordinary wheel-made, hand made, Midianite pottery. The result of the scientific tests was stunning, since it proved that indeed Midianite pottery found in the Negev was imported from a kiln discovered at Qurayyah, in modern Saudi Arabia. Negev pottery is made with the hands and placed on a mat to dry. 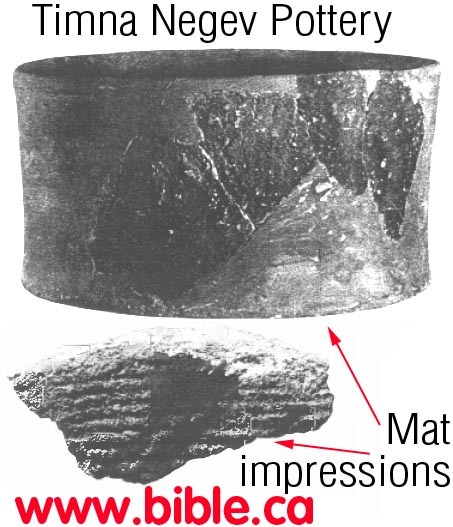 Here you can see the impressions of the mat on the bottom of the pottery. Here are the drawings of some of the hand made pieces found at Timna. More drawings. This hand made pottery was found at the Egyptian Hathor temple in Timna. See detailed study of the Kenites. 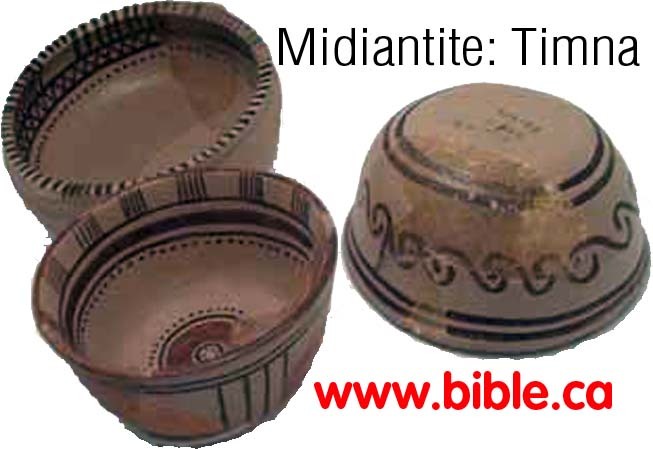 Midianite pottery is characterized by two colour (bichrome) painting and fine workmanship. 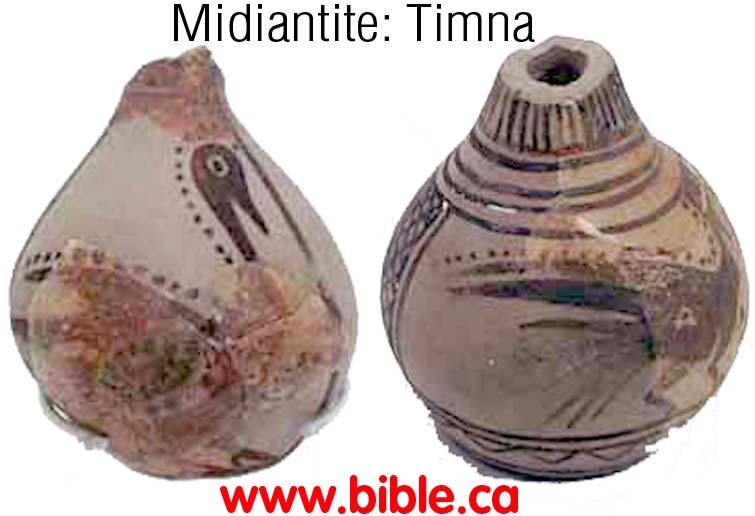 The identical Midianite pottery has been found at Timna, Jezirat Faraun, Al-Bad (near the Straits of Tiran) and Qurayyah north east of Mt. Al-Lawz, where they found the factory where the Midianite pottery was made and exported. 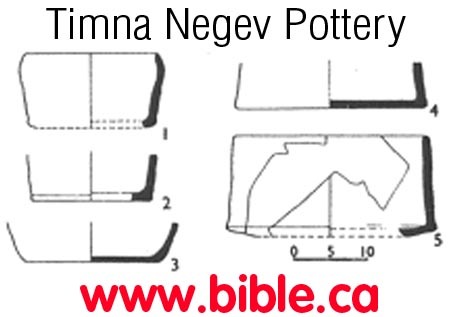 The Kenites migrated with Moses to the promised land and settled in the Negev. They are the link between Israel and Midianite pottery. Timna was in use before the time of the exodus (1440 BC) until about 1200 BC. Solomon took over control of Timna in 950 BC, even though there is no evidence in scripture or archeology that he ever mined there. The Egyptian Hathor temple at Timna is where the "Egyptian steel workers" went to worship on their days off. 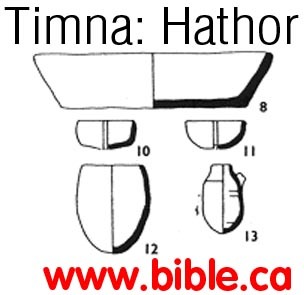 We have clear evidence from the Hathor that it was under Egyptian control between the time of 1440 - 1200 BC. During the time of 1440 - 1200 BC, the Kenites, who were a sect of Midianites, partnered in the mining of metals at Timna. After 1200 BC it appears that the temple of Hathor was defaced and reused by the Kenites or other Israelites. 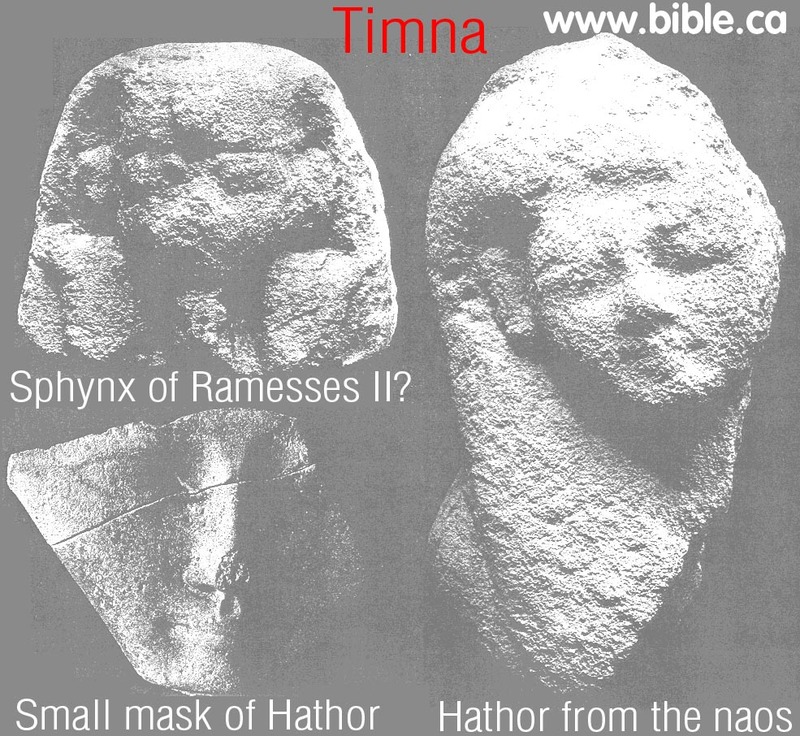 In the naos, statues of Hathor were deliberately defaced and the stones were reused for a second use. This second use is not clear. However we do find a copper snake in the Naos, so it may be a memorial tribute or worship center for the snake. Egyptians also worshipped snakes. The Egyptian goddess "Hathor" is featured with her "cow ears". 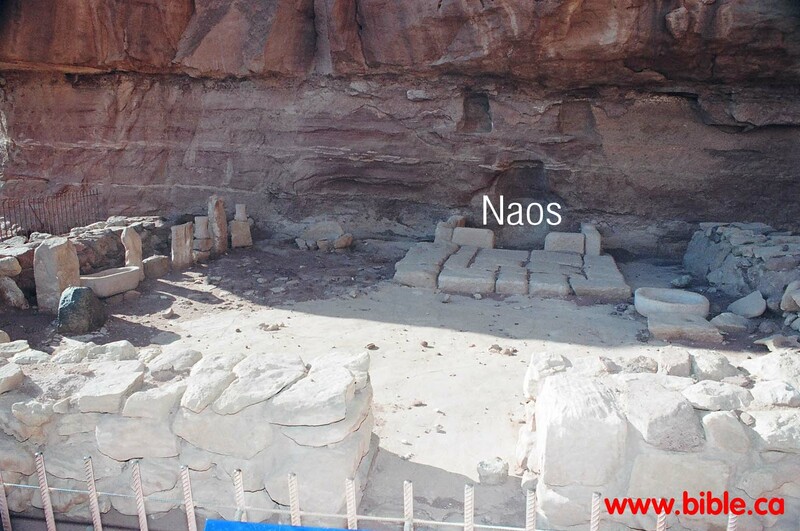 One stone carving was found in the holiest portion of the temple known as the "naos". Hathor with her cute little cow ears! She was a female bovine deity worshipped by the Egyptians. This was found at Timna at the Hathor temple. Warning men: it is not currently a good idea to call your lady friend a cow... times have changed in 3300 years. Jezirat Faraun was used in conjunction with the Timna mining operation. It simply cannot be, nor ever was Ezion-Geber, which was located in Edomite territory on the other side of the Gulf. It is unlikely that Solomon ever used this Egyptian port himself because it was clearly deep inside Egyptian controlled territory. The Bible says that the Exodus occurred in 1440 BC and they entered the promised land in 1406 BC. Rothenberg says they left Egypt 1250 BC. The dilemma that Rothenberg creates is this: Egypt controlled Timna in 1406 BC. The exodus was 1250 BC. Midianites became partners with Egyptians in 1250 BC. Exactly why this is a problem Rothenberg does not say, but we expect that he feels that Israel could not occupy the promised land during the same time that Egypt controlled Timna and Jezirat Fara'un as a mining sea port. In fact Rothenberg is a modernist archeologist who really doesn't believe in the Bible. He regards the entire exodus story as a myth the way the Bible tells it. We accept Rothenberg's dates for Timna and Jezirat Faraun as being under Egyptian control in 1450 - 1200 BC. Had Rothenberg used the Bible as his guide, he would have known the exodus was in 1440 BC. This fact harmonizes perfectly with archeology and the Bible. In 1855, Anthony Charles Harris purchased a papyrus from the period of the 12th dynasty pharaoh, Ramesses III. It is currently housed in the British Museum. The papyrus says: "I sent forth my messengers to the country of Atika, to the great copper mines which are in this place. Their galleys carried them, others on the land journey were upon their asses. Their mines were found abounding in copper; it was loaded by ten thousands into their galleys. They (it) were sent forward to Egypt and arrived safely. It was carried and made into a heap under the balcony, in many bars of copper, like hundred-thousands, being of the colour of gold of three times. I allowed all the people to see them, like wonders". The document proves there was a huge mining operation at Timna in 1250 BC. It is clear that Egypt controlled Timna from before 1500 BC to 1200 BC. 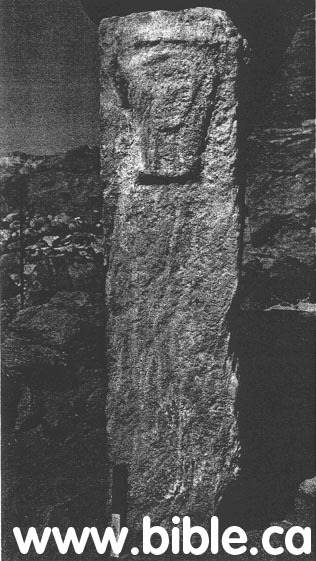 The cartouche discovered at Nahal Roded (above) has two images. Each image features a double feathered crown. 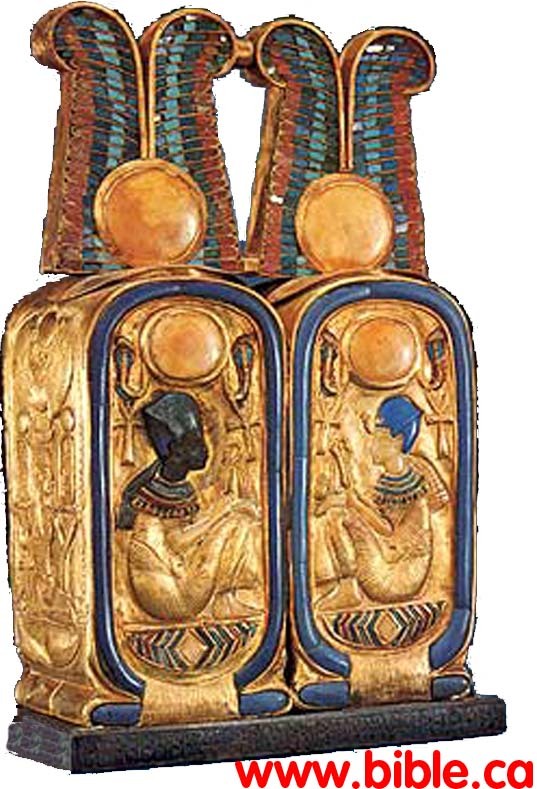 It is exactly the same style of King Tutankhamun who lived about 75 years earlier in 1325 BC. Notice the ovals in the feathered crown represent the Sun God. Here is a photo of the travel route and spring located at Nahal Roded, just north of Elat.